Master Bee Keeper Stan Wasitowski. S & F Honey Farm, Flemington, NJ. This photo was taken at an Apiculture presentation Stan gave at his farm to members of the Raíces Apiculture Initiative. 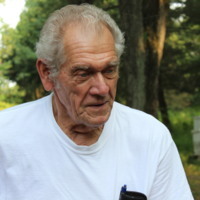 Francisco G. Gómez, “S&F Honey Farm: Master Bee Keeper Stan Wasitowski,” Raíces Cultural Center Digital Archive, accessed April 24, 2019, http://www.raicesculturalcenter.org/digital-archive/items/show/332.